Thank you for supporting Ontario’s heritage. Online – Donating online is secure and easy. We accept Visa, MasterCard and Amex (see below). By mail – We accept donations by mail in the form of cheques, money orders and bank drafts. Donations can be made on a one-time or monthly basis. Please download and complete a donation form [PDF | 63 KB]. By phone – Credit card donations using Visa, Mastercard or Amex can be made by calling 416-314-4903. Download a copy of the Impact Report to learn about the impact donors make. 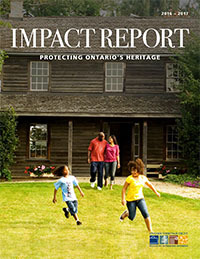 Donations to the area of greatest need are applied where they will have the greatest impact on the important work of the Ontario Heritage Trust as it responds to emerging opportunities and challenges. Help us preserve and steward natural heritage – provincially significant wetlands, watersheds and woodlands; areas of natural and scientific interest and other environmentally sensitive areas; and habitat for species-at-risk – all need our protection. The Trust conserves 27 cultural heritage sites and their collections. By interpreting and conserving our rich cultural heritage, and by celebrating its diversity, we can provide meaningful context to the present. Your support matters. Protect an acre. DYK: The Trust protects 7,378 hectares of environmentally sensitive land across Ontario. When you sponsor an acre of Ontario’s natural environment, you’re protecting our woodlands and wetlands, defending habitat for at-risk species of wildlife and preserving biodiversity. You’re making Ontario a better place to live now and for generations to come. For a minimum donation of $50, you’ll receive a personalized certificate that recognizes your support, as well as a tax receipt. And it’s a perfect opportunity to honour and memorialize someone! The Trust designs events and programs that promote a deeper understanding of the people and events, traditions and practices and treasured places from all parts of Ontario. You can help the Trust provide public programs and educational initiatives that engage Ontarians with the history of our communities. The Provincial Plaque Program, Doors Open Ontario, the Doris McCarthy Artist-in-Residence program, Heritage Week, Heritage Matters (our signature magazine) and educational programs all are made possible through the support of partners, donors and sponsors. This special heritage fund was established in 2006 in honour of this outstanding Canadian to further the work of the Trust in heritage conservation across the province. The Honourable Lincoln M. Alexander (1922-2012) – Canada’s first Black member of Parliament (1968) and Cabinet Minister (1979) – was the first minority group member to be named a Vice-Regal representative, serving as Ontario’s 24th Lieutenant Governor (1985 to 1991). He was Chair of the Ontario Heritage Trust from 2004 to 2010.